The 37-5/8" Cold Steel Pistol Grip Sword Cane looks just like the Pistol Grip City Stick but holds a 25-3/4 inch carbon steel spike in the hollow carbon fiber shaft. A thumb push on the release button and a firm pull on the cast stainless steel pistol grip separates sword from sheath. This cane sword handles like a fencing foil, precise and deadly. The sword's carbon fiber sheath uses that modern material to cut weight and add strength to what once was a frail design. Old wooden sword canes were easily broken, weakened by the hollow core. This unbreakable carbon fiber shaft is strong enough to use for self defense by itself, making this a practical item for non-lethal situations. The Pistol Grip Sword Cane's sword blade of square steel tapers to a thin spike tip. The 1055 spring steel sword isn't designed for slashing or chopping, although the thin steel would do crude damage if used in that way. The sword's tough temper allows parrying and flexing without damage to the blade. Piercing thrusts are the basic movement of this weapon -- the strong spike will run through a four-inch wooden post. A safety lock secures the sword to the shaft until intentionally released, making the sheathed weapon useful as a lashing solid whip or a heavy club depending upon which end strikes the target. 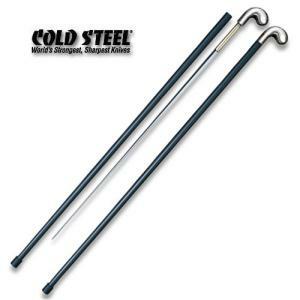 One of the most practical Cold Steel designs, the Pistol Grip Sword Cane makes an excellent hiking pole. The smoothly polished and efficient grip fits the hand comfortably without any rough edges that could wear blisters on long treks.